In Florida and 47 other states you do not have to have a script from your primary physician to see a Doctor of Physical Therapy. That is the point of this ad we ran in the Lynn Haven Ledger in March of 2015. This is one of a string of ads that we designed in-house. That was the beginning of our series of ads with full color backgrounds and busier than most of the ads you saw in the Ledger. Ok, we admit they were the busiest ads. They looked good in the large newspaper format though and we decided to put together a few ads of that style. We hope you liked them for their difference! 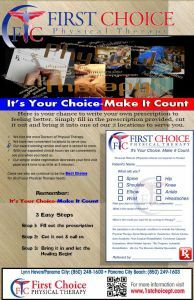 Regardless of the style of the ad, our main thought was always to make sure that we educated the reader that they have the final say in where they go for physical therapy. That is why we include the tag of “It’s Your Choice – Make It Count” in most of our ads.